At Savior Home Services, our electricians have over fifty years of experience providing the local area with high quality lighting and electrical services. We are expertly skilled at lighting installations, recessed lighting, lighting repairs, and lighting retrofitting. 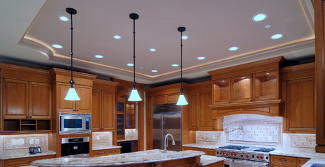 Our electricians are here to help with your next lighting project. Call us today if you need to hire an electrician to assist you with lighting installations, repairs, or performance improvement. Our knowledgeable staff is here to assist you in any way that we can. We would be happy to discuss your needs or prospective project with you and to answer any questions that you may have. We can schedule your appointment today. At Savior Home Services, our professional electricians have the skill to install all manner of lighting systems in your home or business. We can handle the entire project ourselves or we can work hand in hand with any additional remodeling contractor of your choice. Our professionally licensed electricians can install the lighting fixtures that will beautify the look of your property and promote the productivity of your living and work spaces. Whenever there is a problem with your lighting systems, it is important to hire a professionally licensed electrician to conduct the repairs. Our electricians have the ability to troubleshoot your lighting system to determine if it is a problem with the fixture itself or if the its is a problem with the electrical source. By identifying the specific problem that is affecting your lighting system, we can apply the exact solution that will restore optimal lighting performance to your home or business. In this day and age of high energy prices, any reduction in energy consumption can result in substantial savings. At Savior Home Services, our electricians provide a wide range of energy efficient solutions including lighting retrofitting. If you are trying to improve the energy efficiency of your home or business, our professionals can help via our lighting retrofitting services.